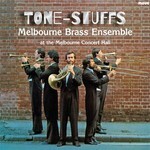 Tone-stuffs / Melbourne Brass Ensemble. Instrumentation: 2 trumpets, horn, trombone, tuba (or 2nd trombone). Contents note: Arrival platform humlet -- There was a pig went out to dig -- Peace -- Shepherd's hey. Arranged by David Stanhope for the Melbourne Brass Ensemble.